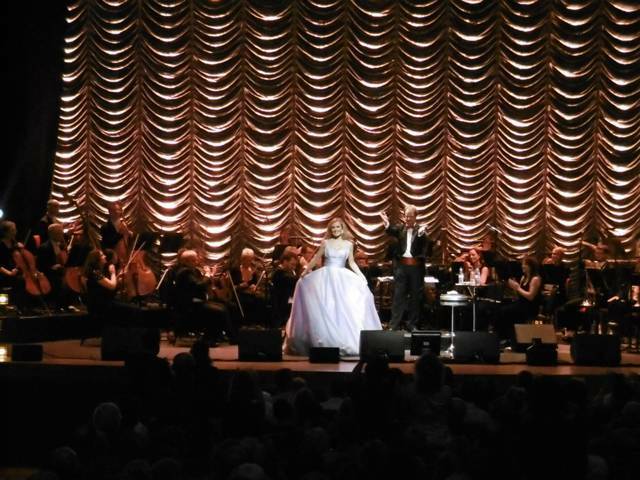 Katherine Jenkins announced at Symphony Hall that the songs chosen for her tenth and latest album, Home Sweet Home, were anthemic and uplifting – so it was no surprise that her concert also proved to be just that. A ten minute overture, Rossini's The Thieving Magpie, by the National Symphony Orchestra, conducted by Anthony Inglis, heralded the Welsh songbird's arrival on stage. And she certainly arrived in style, wearing a voluminous strapless white dress that recalled something you may see a bride wearing on her big day. Beethoven's Ode to Joy, Leonard Cohen's Hallelujah and Anthem from the musical Chess gave the show a classy start, with Katherine promising a walk down memory lane as well as tracks from Home Sweet Home. 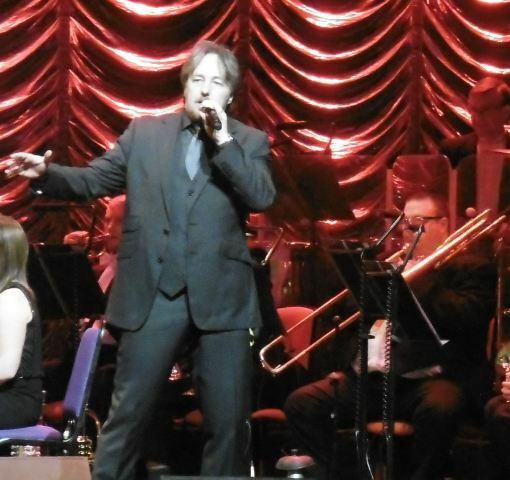 But first we were introduced to fellow Welsh singer John Owen-Jones who gave a superb performance of Music of the Night from Phantom of the Opera, a musical in which he starred in the West End. This was followed by the James Bond favourite Thunderball, selected, he said, because it was recorded by that other famous Welsh singer Sir Tom Jones. In the second half his solo spot featured last year's Eurovision winner Rise Like A Phoenix and Bring Him Home from Les Miserables. To hammer home the Welsh theme Katherine returned wearing a dress emblazoned with a Welsh dragon. Fittingly, she sang Mae Hen Wlad Fy Nhadau, although she said she didn't think she'd be singing after a Welsh defeat to England in the Six Nations rugby tournament. More songs old and new followed after the interval, including a rousing duet, Barcelona, with John Owen-Jones, and a sublime version of The Prayer, which Katherine had sung at her sister's wedding. We also heard about the singer's own marriage in September last year, with American husband Andrew Levitas accompanying Katherine in Birmingham for the first time after a month apart due to work in Los Angeles. A couple of question and answer sessions provoked some laughs, and groans, as Katherine was asked by an audience member to announce that Aston Villa had beaten West Bromwich Albion in that evening's late FA Cup game. She also gave advice to budding vocalists and revealed she wore platform heels, and not 'comfy slippers' with her evening dresses. It was a joyful show, although the song In The Arms of an Angel, was dedicated to a friend of Katherine's who died of cancer aged 32 last year. It was, she said, a sobering time during a momentous year that included an OBE award, her wedding, becoming an aunt and releasing Home Sweet Home. To conclude a memorable couple of hours Katherine performed World in Union and, for the encore, her version of Queen's We Are The Champions. A right royal end to a great night. March 14: Cardiff Motorpoint Arena.